Before considering the results of the tests that I have performed so far, you need to know how reliable and accurate my test method is, and how much of what follows could be trying to make sense from noise. In a later article I will examine error and other issues in more detail, but will cover this briefly here. For each brush tested, I have a series of three sets of measurements, calculated from weight. There is inevitably a spread across each series. For example the largest round brush tested gave results of 523, 509, and 490 cm². The range is thus 33 cm², which is 6.5% of the median value (509). In other words, based on just those three measurements, we could say that the result is 509 cm² + 16 cm². Some synthetic brushes gave highly repeatable results. For example, the W&N Cotman 111 round size 12 gave 122, 124, and 119 cm², a range of just 4%. In contrast, sables tended to have greater variation: the Rowney Diana Sable round size 12 gave 212, 302, and 356 cm², for a range of nearly 48%. In most cases, the first result for sable brushes was much lower then the other two, although that was not always the case. I have thought about making four measurements and discarding the first, which would help push the results for sables even higher. However that could act to the detriment of some synthetics, whose first test results were their best. Further tests and analysis are needed to consider whether the test method can be improved to reduce this variation. Moreover by taking the median (middle) of the three results, the effect of a weaker first test is greatly reduced; the median is particularly good at coping with such data. So for the moment I intend sticking with the method as described in the previous article, but bear in mind that test results did vary, and these are only best estimates. When making comparisons, I think it is wise to assume that differences within 10% or less are likely to be chance, and no meaning should be invested in them. However differences of more than 25% are increasingly likely to represent real and perceptible differences. So two brushes which are reported here as delivering 150 and 165 cm² coverage are likely to be of similar performance. Two delivering 150 and 200 or more are likely to be really different, and you are likely to be able to detect that difference in your painting. 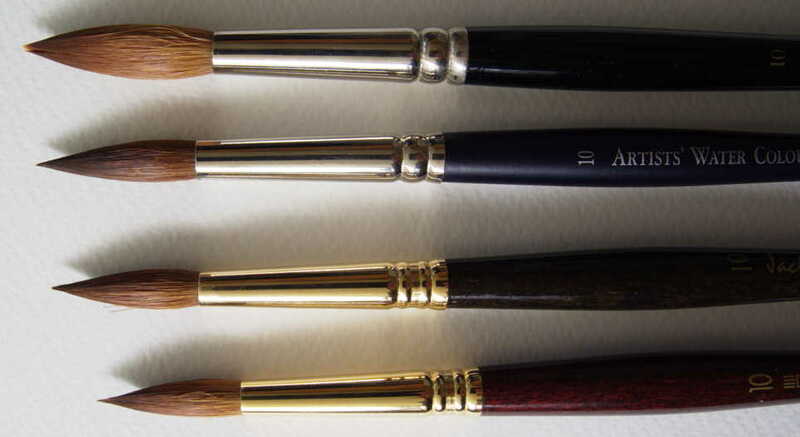 The round size 12 brushes included in these first tests. The top brush is a W&N Series 7 size 10, which is closer in size to the other size 12 brushes tested. The size 12 round is an excellent all-rounder, capable of decent washes, prolonged use for finer work, and quite delicate detail. To do all this, it needs a good capacity for paint, and a fine, springy tip. The ferrule diameters ranged from 7.5 to 8.7 mm, and brush lengths 29 to 32.5 mm (ferrule to tip). Note though that this includes one brush which is officially a size 10: the Winsor & Newton Series 7, which you can see from the photos is significantly larger and longer than all other round size 10 brushes. The Winsor & Newton Series 7 round size 10 at the top is clearly significantly larger than the other size 10 brushes tested. The two synthetics tested are good brushes, but deliver only 100-120 cm² cover, compared with 270-330 cm² for all the sables. Note that I have not yet tested any mixed (sable and synthetic) brushes in this size, but will be doing so shortly. Differences between the sables, as far as their capacity is concerned, are small, and may reflect test variability rather than anything more physical. However their cost differs considerably: whilst I suspect that the high investment in any of the more expensive three will result in a superb brush, the Jackson’s size 12 is far more cost-beneficial, matching the synthetic Cotman in terms of coverage per £. If your budget is unlimited, or you have other strong reasons for selecting one, the three very expensive sables are probably the best. However the evidence here suggests that you should look first at Jackson’s, which is likely to deliver identical (or near-identical) performance for less than half the price. Round brushes of size 10 used in these first tests. Note the W&N Series 7 at the top is much larger, and grouped here with the size 12s. I have not here attempted to test a wide range of round size 10 brushes, but wanted to be able to see the effect of going down two sizes (effectively only one size, as very few manufacturers offer odd-numbered sizes here), among sables. Although the Winsor & Newton Artists’ Water Colour Sable is the clear leader, a major factor in that is that it is the largest of the three brushes, with a ferrule diameter of 6.93 mm and brush length of 28 mm. The other two have ferrule diameters of around 6.2 mm and a length of 25 mm. That said, a size 10 round sable is likely to give you only 50%-70% of the capacity of a size 12, which is a significant reduction. Again the Jackson’s brush delivers the best coverage per £, but is not as efficient in that respect as its size 12 version. I will be testing smaller sizes, and synthetics in size 10, in due course. Brushes larger than size 12 included in these first tests. These are much larger brushes, with much greater ambitions for area coverage. In this first set of tests, I wanted to gauge the differences between rounds, which can still be used for many other purposes, and designs dedicated to wash use, in a single synthetic oval (which is remarkably cheap), and a couple of squirrel mops. Both the squirrel mops showed themselves to have massive capacity, and are the two most capacious brushes I have tested so far. The Raphaël is now almost unobtainable, but is very large indeed, with a ferrule diameter of 19.3 mm. The Jackson’s squirrel mop is of more conventional design, and with a ferrule diameter of 16.52 mm is significantly smaller. If you have a large wash to lay down (or a substantial area of paper to wet), these should be your first choice. However squirrel hair lacks spring, and they are unsuitable for use where you need precision or control. The Daler Rowney Aquafine oval 1″ is not only excellent value, but after the squirrel mops, delivered the highest capacity of any brush tested, better than either of the huge rounds (also synthetics). I have several other flat designs, including some in squirrel and sable, which I will be testing in the near future for comparison. Given the greater precision and control which can be achieved with an oval or flat, these should also be considered seriously. The two synthetic rounds, a relatively expensive Princeton size 30 and much cheaper ProArte Prolene size 24, delivered about twice the area of my benchmark round size 12 sables, which makes them worthwhile if you want such a large round. The ProArte appears to be particularly good value: it has a smaller ferrule diameter than the Princeton, but a slightly longer brush. This category is particularly interesting as it includes my largest round sable (the Escoda size 18) and a ProArte Connoisseur with its mixture of sable and synthetic fibres. The Escoda size 18 sable comfortably exceeded the coverage of the best of the size 12 sables, but fell short of the larger synthetics reported above. Unfortunately it is quite an expensive brush, and although I find it excellent for long work on details, it is not likely to merit consideration if you have a more limited budget. However it is probably the largest round sable available at present unless you are prepared to pay huge sums on a Da Vinci round size 30 or 50, costing over £300 or £1000 respectively. The ProArte Connoisseur size 16, with its mix of fibres, achieved similar coverage to the round size 12 sables, and is slightly cheaper than the Jackson’s size 12, the cheapest of those. However it is also a significantly larger brush, with a ferrule diameter of 11.28 mm (size 12 7.5-8.7 mm) and a length of 38.5 mm (size 12 29-32 mm). The mixed fibres performed significantly better than the ProArte Prolene at the same size, although the all-synthetic version is less than a third of the cost of the mixed-fibre. 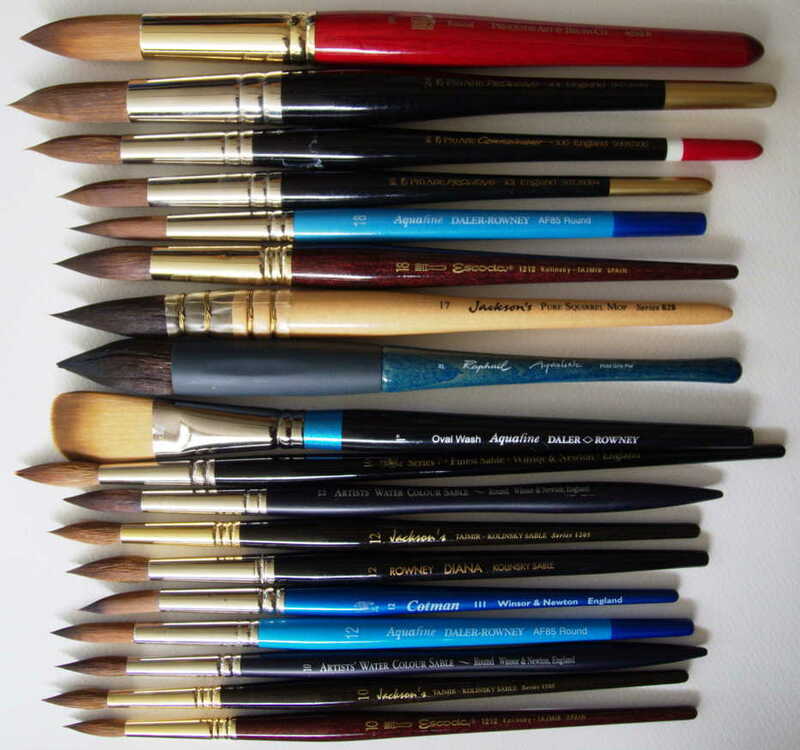 The other all-synthetic brush, a Daler Rowney Aquafine, was nominally a size 18, but very similar in size and capacity to the ProArte Prolene size 16. All the brushes assessed in the first batch of tests. It is reassuring to know that, in general, you get what you pay for: the more expensive the brush, the better coverage you are likely to obtain from it. However, the returns also diminish the more that you pay. 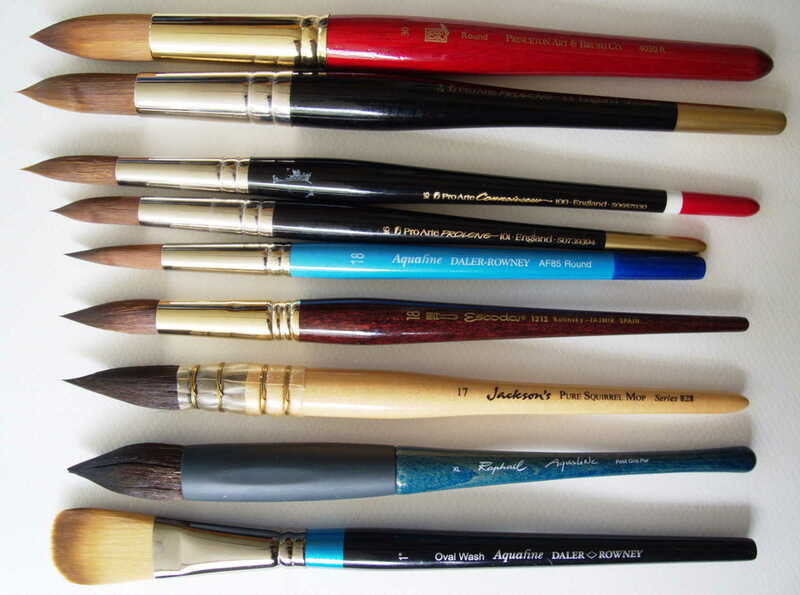 Brushes such as the Jackson’s round size 12 sable, and its size 10 version, deliver very similar amounts of paint to sables which are several times their price. Although I need to test more examples, mixes of sable and synthetic also appear capable of delivering performance which is close to that of pure sables, but at a fraction of the price. If you need to cover larger areas, investing in dedicated types of brush for area coverage, such as squirrel mops and ovals or flats, is likely to be worthwhile. If you were hoping that I was about to demonstrate that cheap synthetic brushes could match the performance of costly sables, then I am sorry that you have been disappointed. However I hope that I have shown how careful choice of brush can deliver better value for money. We cannot all afford to part with £100 for each size 12 brush that we want, but there are some excellent alternatives which cost much less. In the next articles I promise some better surprises, as I analyse these data further, and add more brushes to my database. Declaration of interest: I have no commercial or other connection with, other than being a customer of, Jackson’s or Forget-me-not (my local retailer, in Newport, Isle of Wight). With the exception of a single brush (value less than £10, which I have not tested yet), all the brushes tested were purchased by me from Jackson’s or Forget-me-not. These tests were carried out independently of all manufacturers and retailers. Posted in Painting, Technology and tagged brush, cost-benefit, method, painting, procedure, sable, synthetic, testing, watercolour. Bookmark the permalink. Q&A: All in a day?